Fresh herbs from your own kitchen garden or container is a wonderful way to ensure you always have on hand exactly what you need. Examples of some of the herbs we have at English Country Gardens are listed below. Availability subject to change without notice. * Pinch frequently to develop branching. This in turn will yield good leaf production. * Basil is extremely sensitive to cold temperatures. Always keep above 55degrees even at night. * Generally, herbs do not like to sit in water. Consistent, modest moisture is essential to avoid disease . 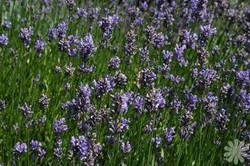 * Lavender and Rosemary are sensitive to extreme dry-down, causing top burn or mildew. Keep moisture consistent, yet moderate. CLICK ON ANY OF THESE PHOTOS TO SEE A LARGER VERSION OF THE PHOTO. 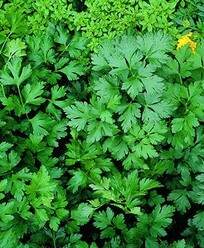 Italian - - Flat-leafed, Italian Parsley favored for its deep flavor, some say holds up in cooking better than other parsley varieties. High chlorophyll content makes it a natural breath sweetener. Great for containers & kitchen gardens. 12 inches tall, light, well drained soil, space 15 inches apart. Triple Curled - A kitchen standard, Curled Parsley is terrific in just about any dish. 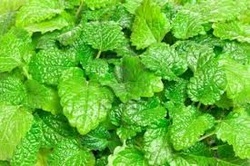 Can be dried and used as a garnish, or fresh and chopped fine over a nice fish dish. You'll have trouble finding a place this multipurpose herb can't be used! 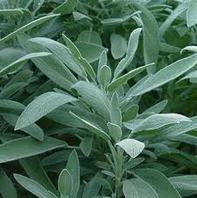 Common - Sage is a very popular herb, a shrubby perennial that may reach 18 - 24 inches tall with a sprawling growth habit. Common sage has gray-green, wooly leaves. Leaves can be harvested before blooming begins, or cut stems 6 - 8 inches long and allow to dry.